Our GroundSchool FAA written test preparation software, apps, and other materials contain actual questions that you will see when you go to take your FAA written exams. In a word, YES. 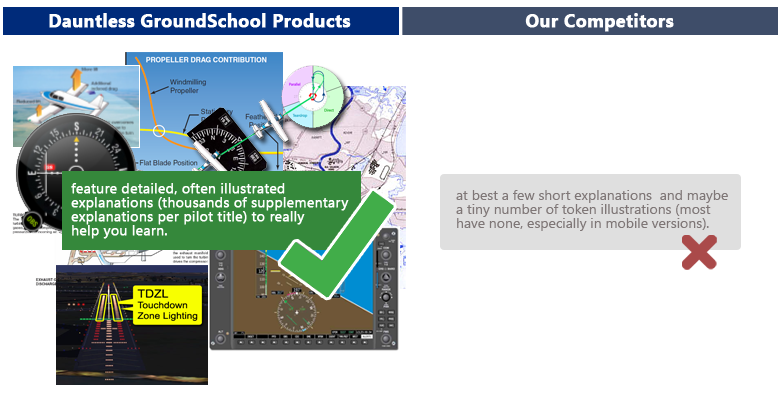 GroundSchool provides actual, current (2019) FAA questions. These are continuously reviewed and updated by our editorial staff. If you conscientiously study using our GroundSchool FAA written test prep software, you will in all likelihood find the questions and answers extremely familiar when you go to take your actual test. In fact, if you're like most people who have done a good job studying using GroundSchool, you will not only pass your test, but you will ACE it. Small caveats to this: Occasionally there may be a small number of questions that have not yet reached us due to the way that the FAA informs test prep sources of updates and there may be a few questions from time to time that are worded differently. Such changes are highly likely to be quite minor and rest assured that if we don't have it yet, it's unlikely that any other written test prep provider does either. Two, occasionally the FAA throws in ungraded and/or experimental questions. We are not informed of such questions, but they are generally not graded, either. These exceptions notwithstanding, your score overwhelmingly depends on you studying the questions as we have them presented. We very strongly recommend that you do not memorize the questions as the FAA is increasingly relying on alternate wordings and slight question variations to discourage this and, well, because it's actually ultimately counter to your goal of becoming a safe, knowledgable, and efficient pilot or mechanic. 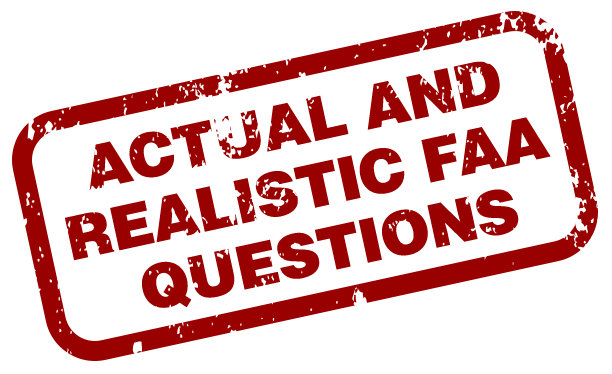 Rather, study the questions and our detailed explanations to best prepare you for variations that you might see both in the test and, more importantly, in real life. Please read the Questions and Answers below, and, once you have done that, please see our GroundSchool News Page for information about FAA updatse, changes, and our reactions to them. Will these questions be the same if I am taking my test at a CATS or LASERGRADE center? Yes, they will. Virtually everybody takes their FAA written tests at a CATS or LASERGADE center (even if this is located in your FBO or Flight School). The FAA questions are the same no matter where you take the test. Will these questions be the same if I am taking my written test at an FAA written test prep center in Le Bourget, France? Again, it doesn't matter where you take the test or with what provider. The FAA test bank that your test will be generated from will be the same. I saw an FAA PDF document on the internet that had (for example) 512 questions for a given test, but your test bank shows more (for example, 954). If I use GroundSchool, will I be studying too many questions? Absolutely not. The PDFs that the FAA publishes have an incomplete, sample only test bank that does not reflect the totality of the questions that you might be asked. If you study using only the FAA PDF (which by the way doesn't have correct answers and explanations, as our software does), you will most likely be studying far less than is required and will perhaps severely hurt your chances of doing well in the process. In a change from the practice of several years ago, the FAA no longer releases the full test banks directly via the website. I saw an FAA PDF document on the internet that had (for example) 413 questions, but your test bank shows fewer (for example 341). What's going on? If we have fewer questions for a given test than the FAA has in a question PDF, then this is what's going on: the FAA PDFs represent test banks. Each test bank contains one or more tests. For example, the FAA Private Pilot test bank contains questions that apply to the private pilot airplane test and private pilot helicopter test (among others). In GroundSchool, the questions are carefully sorted so that you only study the questions that apply to your exact test. So therefore, in this example, of the 413 questions in the bank, only a subset of those apply to your particular test. This doesn't mean that 341 questions (from this example) necessarily come from the 413 in the PDF â€“ it could be, for example, that 200 come from the PDF and another 141 come to us from the question list that the FAA does not publicly release via its website. I saw another company's product that had "2020" stamped on the cover. Do they have the 'official' 2020 questions and how does this relate to your GroundSchool product? The stamping of a year on the cover of a test prep book is mostly a marketing gimmick aimed at both you (the pilot) and individual sellers. The truth is that the FAA releases questions and updates continuously and somewhat asynchronously throughout the year, and the start of a new year has no particular meaning as far as the questions go. So, what happens is that some book companies will take their current set of questions in, say, mid-Summer 2019 and send these off to the printer to create a "2020" book. This causes nervous test-goers to be worried that they have 'out of date' material and also creates a system where consciencious students would be forced to buy an updated version of the book with a semi-misleading title year-in, year-out. With GroundSchool, there are no such troubles. For one, updates are free for life for individual users. What this means is that you can upgrade your copy of our software to the latest avaialble at any time, free. Yes, we do put dates such as "2019" or "2020" on the main menu of our software and so forth, but this only serves as a reassurance and guide to the user (otherwise, we have found that users, perhaps having been mislead by our competitors' year stamping, end up asking us a lot of questions about this.) Unlike with our competition, with GroundSchool you can have access to up-to-date material contiuously throughout the year and for years to follow without additional cost to you. We believe that this is by far the most generous and sensible policy out there - what we ask in return, however, is your honesty; You may NOT transfer (lend, give, sell, etc.) the software to anybody else, even when you are done using it. Rather, we ask you to please direct your fellow pilots to purchase their own copies. This is a fair system that allows us to continue to bring you the best product at the best possible price. What is the main factor as to how well I will do on my written test? There's absolutely no benefit to you in spending hours obsessing over the technical details of the FAA written test banks - leave that to us. Rather, concentrate on studying the material as presented, and you're highly likely to do just great, just like thousands of pilots and mechanics before you. Do you offer a "Passing Guarantee?" No -- and for good reason! Our philosophy is not only to provide the best FAA written test prep out there, but also provide it at the lowest possible cost. Compare us to our competitors and we're confident that you'll see that we provide more for less, including free lifetime updates for our GroundSchool PC products. The vast majority of the tens of thousands of pilots and mechanics who have used our FAA written test prep materials since we started offering them in 1997 pass their tests. So- why don't we offer a passing guarantee? In short, because passing guarantees are useless gimmicks. If you don't know any better, such a guarantee may at first sound comforting when you go to buy a test prep, but in the end all such guarantees amount to is that those who study hard and put in the time necessary to learn the material end up subsidizing those who didn't put in the time and effort necessary to pass. Add in the time and complexity involved in administering such a guarantee program and you'll see that such programs are really expensive and basically worthless. Not convinced? Take a closer look at our competitors' offerings. If you see their websites, they write terms such as "Passing Guarantee!" in big prominent letters. It may seem at first that this applies to all of their test prep products. Look more closely, however, and you'll see (at least, at this time of this writing) that this guarantee only applies to their overpriced "courses", not their regular test prep books and software. These "courses" typically amount to little more than you getting a short outline on a block of questions (far less, typically, than what we provide via our question explanations) followed by some questions to learn. After you go through several such blocks, they give you several simulated FAA written tests as a "final exam." If you pass those exams with a high score you're entitled to their guarantee. Well, guess what. You can do the same thing for far cheaper with our software. You can take an unlimited number of practice tests using GroundSchool and then go take your real test when your scores are good. For example, for our online instructor endorsement service, we require that people take 5 practice tests, each with a score of 90% or above. In the 10 years that we've been offering this service, not one person that we know of who has used this service has ever failed their exam. Just say no to worthless "guarantees!" Say YES to our lower priced and more efficient study methods! How is GroundSchool better than its competitors? Answers to this question are many - from the depth and quality of our explanations to the number of study and learning modes to the superior ease of use. In every aspect, we're committed to bringing you a high quality test preparation product that will help you not just pass the test, but also be well prepared for your avaition life. Learn more about why our FAA knowledge test learning content and why it's better than that of our competitors here. Thank you for checking out GroundSchool!